After seeing Black Panther this weekend and loving every second of it, my spouse and I got home and started talking with about what we thought made the film so amazing. It eventually dawned on me that outside of my intense nerdiness and desire to see more positive representation of people of color in movies, I loved Black Panther because it showed one of my favorite elements of a great story: murky morality and finding a way forward. Morality is a weird thing. In our daily lives, it’s pretty straightforward: be nice and don’t be a jerk. When it comes to the lingering problems that arise from colonization and racism and what needs to be done in order to rectify them, it gets complicated. Wakanda survived for centuries as a bastion of African culture and excellence by retreating from the world (and also having a massive stockpile of the miraculous element, vibranium). With vibranium-backed science, Wakanda hid and thrived as a technological powerhouse, keeping itself out of the hands of those who would have bled them dry. While this was an excellent strategy for the kingdom, it damned the rest of the continent, much like how T’Chaka left Erik to fend for himself in a country that, at best, treats his mere existence with utter disdain. Erik saw firsthand on a daily basis how much contempt the West has for the people that it has been systematically oppressing for centuries, and he wanted to do something about it. Granted, his plan called for a violent global uprising which would have killed countless innocents, but it had at its heart a desire for liberation which is admirable. This isn’t to say that Wakandans were ignorant of the goings on of the world (Nakia begs T’Challa to open up the kingdom and help the world, Shuri calls Ross a “colonizer”, etc. ), but they never had to deal with the day-to-day belittling and denigration of people of color like Erik did. This lack of perspective and coming to terms with the ugly truth of not just the world around him but also what heinous acts his own father committed is what T’Challa wrestles with during the film. In the end, he heeds both Erik and Nakia and finally brings Wakandan knowledge to the world, which will, in theory, benefit everyone, including the oppressed. It remains to be seen if this will actually work in liberating folks around the globe, but it does signal an important first step (as well as a way to handle Thanos when he finally shows up in Infinity War). The dilemma found in Black Panther is the kind of plot I love to read/watch/play through. It’s one where the “good guys” are not as good as you think they are, the “bad guys” actually have a good point to make, and the main character has to forge a new path. My favorite game of all-time, Fallout: New Vegas, takes this notion and waxes philosophical with it. In New Vegas, Hegelian Dialectics were used to justify the war between the Legion and the New California Republic, and you can potentially choose to take a path that could be a combination of the two by ruling New Vegas yourself. What Caesar describes is exactly what happens in Black Panther: Wakanda is the thesis, and Erik is its antithesis. When they meet each other, the resulting conflict created the synthesis: the outreach centers and revealing the true nature of Wakanda to the rest of the world. Whether or not this synthesis truly removes the flaws of T’Challa’s traditional vision of Wakanda and Erik’s violent liberation ideology is still in question, but at the very least, hundreds of millions of people are not going to die and many will have a good chance for a better life. This narrative structure is more complex than what is normally found in comic book movies. Usually, the villain’s main goal is simplistic, such as killing everyone and everything in their path, and the hero does not really undergo any significant change, morally speaking. 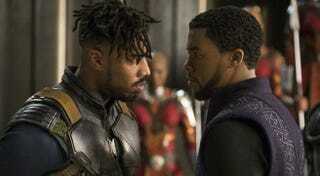 Black Panther subverts this by making both the main character and the audience think about the motives of all the sides involved and what makes them “right” or “wrong”. I hope that future Marvel/D.C. movies follow this style, because while I like gawking at grandiose slugfests that have a CGI budget larger than the GDPs of several countries, I want what I am watching to make me think, too.